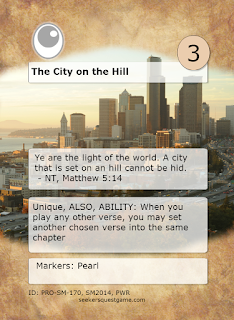 Verse Rule: Unique, ALSO, ABILITY: When you play any other verse, you may set another chosen verse into the same chapter. This scripture is a great one, where Jesus, in the Sermon on the Mount, tells his followers to go out and do good, and flavor the world (verse 13) or light it up (verse 15,16). The point is summed up in verse 16, to “glorify your Father which is in Heaven”. It’s interesting that we increase God’s glory by serving his children. This card is a powerful one, that can really speed up your chapter-building. You play it, and from that point on, you set a verse every time you play a verse. That can accelerate things quickly. To keep things from getting too out of hand, however, we made it unique, so that it can’t be played again. So, if your opponent plays it, close out the chapter it’s in as soon as you can, or play something that removes verses from the tabletop! 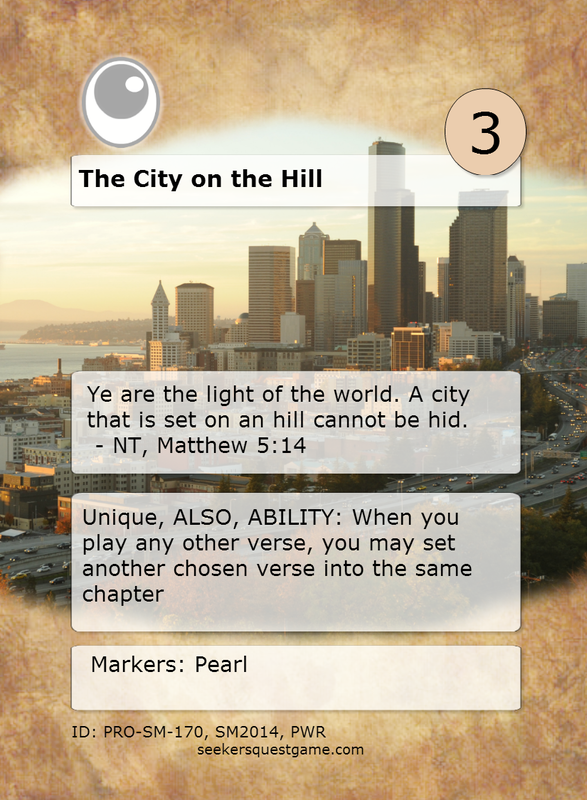 This verse may be found in the Scripture Mastery Set!